Anciently, in Israel, God’s chief concern was with the events happening inside the nation and temple. At that time, the temple was the only place on Earth where God’s work could be found. History shows, as things went in the temple, so went things with the nation. Study Judah’s annals. Its kings either led the people to God and His temple or astray into paganism. God holds the same concern for His temple, or Church, today. God’s primary concern is always His temple. Why? God’s work is always done from His temple. There are many lessons we must learn from Israel’s history. 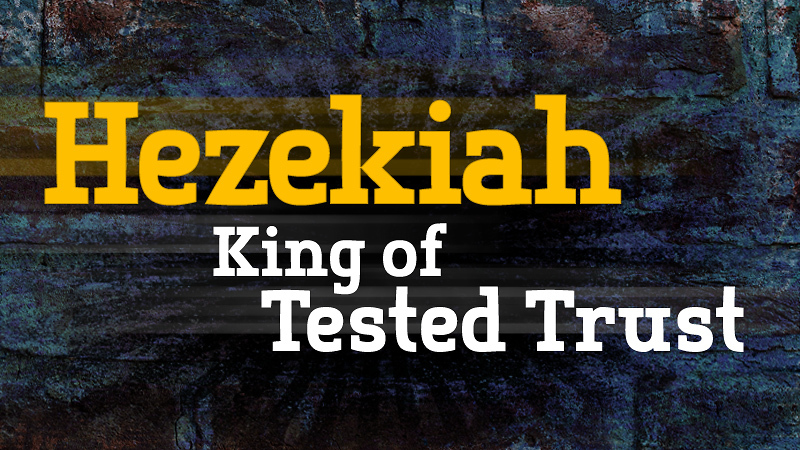 Hezekiah was considered one of Judah’s greatest kings. At one point in Hezekiah’s reign, Assyria was about to destroy the nation. Hezekiah appealed to God through Isaiah and God miraculously saved the nation. He turned another nation against Assyria. God solved this major problem for Hezekiah and the nation of Judah. You can study more about this incident in Isaiah 37. Hezekiah then had to face another big problem. “In those days was Hezekiah sick unto death. And Isaiah the prophet the son of Amoz came unto him, and said unto him, Thus saith the Lord, Set thine house in order: for thou shalt die, and not live” (Isaiah 38:1). Isaiah came to Hezekiah and told him that he would die as a result of his sickness. This came as quite a shock to Hezekiah. At this point in his life, he handled the situation correctly. “Then Hezekiah turned his face toward the wall, and prayed unto the Lord, And said, Remember now, O Lord, I beseech thee, how I have walked before thee in truth and with a perfect heart, and have done that which is good in thy sight. And Hezekiah wept sore” (verses 2-3). Hezekiah turned to God and prayed. At this point in his life, Hezekiah was close to God. Look at how God responded to Hezekiah’s prayer. “Then came the word of the Lord to Isaiah, saying, Go, and say to Hezekiah, Thus saith the Lord, the God of David thy father, I have heard thy prayer, I have seen thy tears: behold, I will add unto thy days fifteen years” (verses 4-5). God saw that Hezekiah was walking by faith. He saw Hezekiah’s tears. Isn’t it impressive that God took note of his tears? God added 15 years to Hezekiah’s life. Then God performed another great miracle for Hezekiah. “And I will deliver thee and this city out of the hand of the king of Assyria: and I will defend this city. And this shall be a sign unto thee from the Lord, that the Lord will do this thing that he hath spoken; Behold, I will bring again the shadow of the degrees, which is gone down in the sun dial of Ahaz, ten degrees backward. So the sun returned ten degrees, by which degrees it was gone down” (verses 6-8). God reversed the rotation of the Earth to prove to Hezekiah that He would fulfill His promises to him. Although God performed some mighty miracles in his life, the end of the story about Hezekiah is not a happy one. Not long after his healing, Hezekiah had to face another difficult problem. The king of Babylon sent communication to Judah’s king that he was very concerned about his illness. But was he really concerned about his illness? “At that time Merodach-baladan, the son of Baladan, king of Babylon, sent letters and a present to Hezekiah: for he had heard that he had been sick, and was recovered. And Hezekiah was glad of them, and shewed them the house of his precious things, the silver, and the gold, and the spices, and the precious ointment, and all the house of his armour, and all that was found in his treasures: there was nothing in his house, nor in all his dominion, that Hezekiah shewed them not” (Isaiah 39:1-2). This time Hezekiah fell into a serious trap. He became all puffed up knowing that the king of Babylon was so concerned about him. In his vanity, he showed the king’s messengers all of his treasures—a fatal mistake. Isaiah was more suspicious and wise about the king of Babylon’s message. Isaiah came to Hezekiah and asked him some hard questions. But Hezekiah did not respond to all of Isaiah’s questions. “Then came Isaiah the prophet unto king Hezekiah, and said unto him, What said these men? and from whence came they unto thee? And Hezekiah said, They are come from a far country unto me, even from Babylon. Then said he, What have they seen in thine house? And Hezekiah answered, All that is in mine house have they seen: there is nothing among my treasures that I have not shewed them” (verses 3-4). Notice here that Hezekiah does not answer Isaiah’s first question—he completely ignores it! He does answer Isaiah’s second question. Why did Hezekiah not answer the first question? Could it be that at this point he was beginning to turn away from God? Remember, God did add 15 years to his life. This proved to be tragic for this great king. Hezekiah fell away from God during these additional years allotted to him. By the end of the story, it looks as though Hezekiah had lost it all spiritually. Could it be that Hezekiah did not answer the first question because he was cozying up to Babylon? The fruits of Hezekiah’s life prove this to be so! Hezekiah’s vanity got to him. Notice that he answered Isaiah’s question in a boastful manner. A king from a far country was interested in him. He told Isaiah that they were come “unto me.” Hezekiah showed them all of his treasures. In his vanity, he allowed potential enemies to see all that God had blessed him with. Never did it dawn on Hezekiah that these men could possibly want to destroy him and carry off his treasures. Isaiah was concerned about Hezekiah’s actions because he could see far better than Hezekiah could—spiritually speaking. Isaiah did not trust the king of Babylon. He recognized that Hezekiah was getting too close to Babylon. He prophesied about the end result of Hezekiah’s relationship with the king of Babylon. Isaiah showed that this relationship would prove to be fatal, not only for Hezekiah’s descendants, but for the nation of Judah as well. “Then said Isaiah to Hezekiah, Hear the word of the Lord of hosts: Behold, the days come, that all that is in thine house, and that which thy fathers have laid up in store until this day, shall be carried to Babylon: nothing shall be left, saith the Lord. And of thy sons that shall issue from thee, which thou shalt beget, shall they take away; and they shall be eunuchs in the palace of the king of Babylon” (verses 5-7). What a tragic end for Hezekiah. These actions by Hezekiah were the beginning of the undoing of his family’s lives and the undoing of the nation of Judah. The king of Babylon destroyed God’s temple and carried the nation of Judah away captive. There is a very clear lesson here for all of us. What was Hezekiah’s main problem? He evaded some hard questions from God’s prophet. He did not want to tell Isaiah what the messengers from Babylon said. At times it is so easy for us to evade hard questions. Carnally, we want to let the hard questions slide. Facing, or not facing, hard questions generally marks a turning point in our lives. Being willing to face hard questions can turn our lives around spiritually. Evading hard questions can take us away from God. Hezekiah evaded a hard question from Isaiah. But Isaiah pinned him down (verse 4). Isaiah wanted to show him that he was beginning to rely on his own treasure or strength, instead of God. Isaiah wanted Hezekiah to recognize that he was beginning to rely on Babylon. Unfortunately, Hezekiah was not moved by his discussion with Isaiah. The whole nation was conquered by Babylon. What a terrifying punishment! What about us? Sometimes God, through His ministers, has to ask us some very hard questions too. 1. What kind of response do you hope for when you give someone a gift? 2. How does gaining fame and fortune affect a person’s tendency to express appreciation to others? 13. How does a serious illness or accident change our prayer habits? 14. What causes us to forget to thank or praise God for His blessings? 15. What kind of response does God want from us when He gives us good gifts? 16. Once we have sinned and disappointed God, what can we do to avoid His discipline? 17. In what ways do you feel God has tested you recently? 18. What unfortunate legacy did Hezekiah leave another generation because of his pride? 19. Why might a person turn down a gift offered by another person or even by God? 20. What could you do this week to help your regular prayer life become more like your emergency prayer life? 21. If the Lord tested you this week, what would be your greatest motivation and priority?